Juki TL-2000Qi has the power to go through multiple layers of heavy duty fabrics. But you still have to own a regular sewing machine for jobs other than straight stitching. First of all let me clear two things. Juki TL-2000Qi is a straight stitch (and reverse) only machine. This does not feature speed control slider and stuffs like that. It is a simple and easy to use sewing machine. There is nothing complicated about this one. The machine is constructed of aluminum die-casting to keep up with the quality of an industrial sewing machine. The throat comes to 8″x7″, which is really good enough, never forget the extension table with which you can extend the work space to accommodate large projects. The machine has a strong and powerful motor capable of delivering 1500 stitches per minute. Juki TL-2000Qi comes with unique foot controlled thread trimming system. With this, you just need to rock your heel back on the foot control, and the machine cuts the thread for you. If you want to use the thread cutter in the conventional way, you can always use the push button provided in front of the machine. But the foot control trimmer is much more useful as you can do everything in one motion. However, it will take some time to get used to, sometimes you might even cut the thread in the middle of a project. So be wary of that. The automatic needle threader threads the needle without eyestrain. Presser foot pressure can be adjusted manually according to the fabric used. The needle up/down button is a quilter’s favorite. The machine can be set to stop with the needle in the up/down position according to your requirement. The needle down position is handy while pivoting or while doing free-motion projects. It is like having an extra hand to hold the fabric. The machine has drop feed. You can raise or lower the feed dog with the help of a lever. Bright LEDs illuminate the work space. Knee lever is another premium feature on Juki TL-2000Qi. With the knee lifter you can raise or lower the presser foot with your knee, you don’t need to use your hands. The presser foot can be raised as high as 12mm. The machine is reasonably heavy. It weighs around 28 pounds, so it won’t be that easy to move around. Juki TL-2000Qi is a sturdy sewing machine. I think it is a great tool for quilters. TL-2000Qi is not an out and out industrial machine, it is sort of a connecting bridge between a home sewing machine and an industrial machine. The machine is ideal for multiple layers of thick fabrics. 8 layers of denim was a breeze. The sewing speed is controlled by a microcontroller for accurate feed and consistent stitch quality. It can even sew lightweight leather, while hard leather can be bit of a struggle. If you intend to use leather, make sure that you have a leather needle, otherwise you will break the needle 9 out of 10 times. Going slow with thick fabrics will bring best results. The foot pedal response is pretty good. You will have good control over the sewing speed. There are no issues like stitch skipping or thread nesting. The machine sews fast and even at those speeds, there is no deterioration in stitch quality. The machine is very stable even while sewing 8 layers of denim. 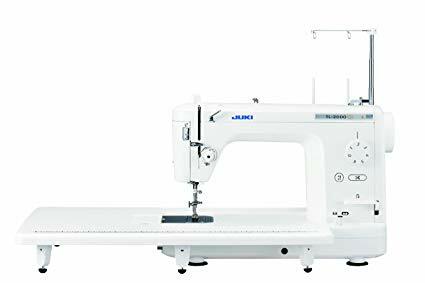 Juki TL-2000Qi being just a straight stitch sewing machine, you will always need a regular home sewing machine to make you complete as a sewer. I know that this is not a limitation, the reason I included it as a limitation is because I couldn’t find any other fault with this machine. Juki TL-2000Qi does excellent straight stitches. At least that is what it is designed for. It certainly is one of the best straight stitch machines I have tried my hands on. Those who do a lot of free-motion quilting, this is the one to own. Overall, TL-2000Qi is a solid performer.